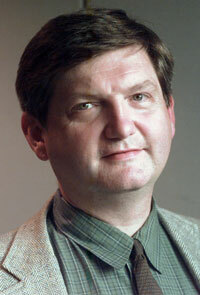 James Risen is a free-press hero. Whether he will also prove to be a First Amendment hero depends on the U.S. Supreme Court. Both the Bush and the Obama administrations have pushed for Risen to give up his source, but Risen has refused. “The choice is get out of the business — give up everything I believe in — or go to jail. They’ve backed me into a corner,” Risen was quoted as saying in this Boston Globe article by Eric Moskowitz. Also weighing in with a detailed account of the NEFAC event is Tom Mooney of The Providence Journal. There’s no one anywhere on the vast landscape of American journalism who merits this award more than you do. It is hard to imagine a more principled and patriotic defense of the First Amendment. Unfortunately, Risen has little in the way of legal protection. The Supreme Court, in its 1972 Branzburg v. Hayes decision, ruled that the First Amendment does not protect journalists from having to reveal their confidential sources. In addition, there is no federal shield law. Thus journalists like Risen must hope that the attorney general — and, ultimately, the president — respect the role of a free press in a democratic society sufficiently not to take reporters to court. President Obama has failed that test in spectacular fashion. Risen has asked the Supreme Court to take his case, giving the justices an opportunity to overturn or at least modify the Branzburg decision. But if the court declines to take the case, the president should order Attorney General Eric Holder to call off the dogs. The Stephen Hamblett Award is named for the late chairman, chief executive officer and publisher of The Providence Journal. Previous recipients have been the late New York Times columnist Anthony Lewis, then-Boston Globe editor Marty Baron (now executive editor of The Washington Post) and Phil Balboni, founder of GlobalPost and, previously, New England Cable News. More: On this week’s “Beat the Press,” my WGBH colleague Margery Eagan paid tribute to Risen in the “Rants & Raves” segment.